ADJ is pleased to announce that the brand new AV3 Video Panel is now shipping. Offering a tight pixel pitch of 3.91mm (0.25”) as well as bright output and high color contrast, the AV3 is the perfect LED video solution for situations where the panel may be viewed by an audience close-up. It also has an incredibly competitive price for such a product, opening LED video walls up to installations and productions for which they previously would have been out of budget. Building on the success of ADJ’s first LED video panel, the hugely successful AV6, this new product inherits many of the popular traits of the original model but allows a shorter effective viewing distance. With impressive brightness of 1000 NITs and a wide viewing angle of 120-degrees, both horizontally and vertically, the AV3 is ideal for a wide variety of applications including churches, leisure venues, conferences, and concerts. Powered by extremely bright 3-in-1 SMD2121 LEDs, each panel has a pixel density of 128 x 128, which is equivalent to 65,536 per square meter. This makes for a minimum viewing distance of just 13ft (4m), compared to the original AV6’s 20ft (6m). Therefore, the AV3 is suited to applications where the audience will likely view the panels from a closer distance, for example in a nightclub or bar. As with the AV6, each AV3 panel is divided down into four mini modular panels, which allows for easy serviceability. This means that in the unlikely event that a pixel fault should occur only one of the four mini modules needs to be replaced and returned for repair, not the whole panel. The AV3 is also fitted with a useful new feature, a retractable handle, which makes carrying panels easier both for installers and touring road crew. The AV3 panels also have a flexible design, making them equally suited to permanent installations as they are for tours and one-off events. Any number of panels can be easily linked together to provide continuous video displays of any size and shape. As with the AV6, quick-locking connectors on the top edge and left side of each panel effortlessly secure to the matching holes on the bottom and right side of adjacent panels, allowing multiple AV3s to be joined together quickly and easily. Mounting points at each corner of the panels allow for permanent installation, while the separately-sold AV3RB1 Rigging Bar can be easily connected to the top row of panels on a screen to allow it to be hung from event rigging. The AV3RB1 has a maximum load capacity of 15 panels in a single vertical hang, allowing for the creation of extremely large video screens. The AV3 is economical to run, when compared with other LED video systems, with a maximum power consumption of 170W per panel and an average consumption of 70W per panel. Each panel is fitted with professional powerCon input and output sockets allowing the power supply for multiple panels to be linked together. Locking etherCON input and output sockets are also provided for each panel, allowing the signal data to also daisy-chain across each panel that makes up a larger screen. Measuring 19.75” x 19.75 x 4” (500 x 500mm x 100mm), the AV3 is neatly compact. This makes it ideal both for permanent installations, with minimal space required behind the LED screen, and for touring applications, with multiple fixtures fitting into a single road case. The panels are also lightweight, each weighing 20lbs. (9kg), which again is beneficial for mounting as well as storage and transportation. To make it easy to take an AV3 system out on the road, ADJ has also introduced a brand-new road case specifically designed to store, transport and protect AV3 panels. 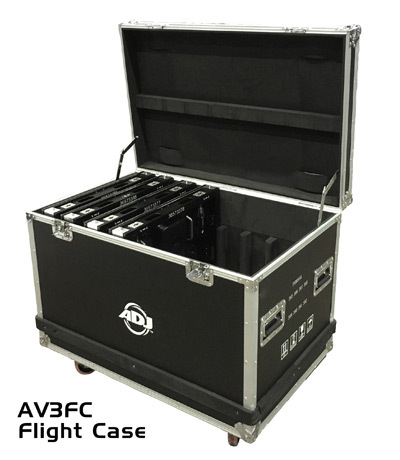 The heavy-duty AV3FC road case is constructed from 9mm plywood, reinforced with steel ball corners, and fitted with four carry handles and four swivel castors. Inside, the case is divided up into eight sections, each lined with foam and designed specifically to accommodate an AV3 panel.